Dong Song is a research associate professor in the Department of Biomedical Engineering, University of Southern California. He received the B.S. degree in Biophysics from the University of Science and Technology of China in 1994, and the Ph.D. degree in biomedical engineering from the University of Southern California in 2003. He is a member of the American Statistical Association, the Biomedical Engineering Society, the IEEE, and the Society for Neuroscience. 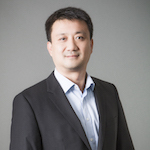 Dong Song's main research interests include nonlinear systems analysis of the nervous system, cortical neural prosthesis, electrophysiological mechanisms of learning and memory formation, and development of novel modeling techniques incorporating both statistical and mechanistic modeling methods. Together with Drs. Marmarelis and Berger, he developed the multiple-input, multiple-output (MIMO) nonlinear dynamical model that serves as the computational basis of the hippocampal memory prosthesis. He has published over 70 peer-reviewed journal articles and book chapters.